I was looking at some illustrations for Charles Perrault’s “La Belle au Bois dormant” (1697) and just had to try my hand at the rose vines. 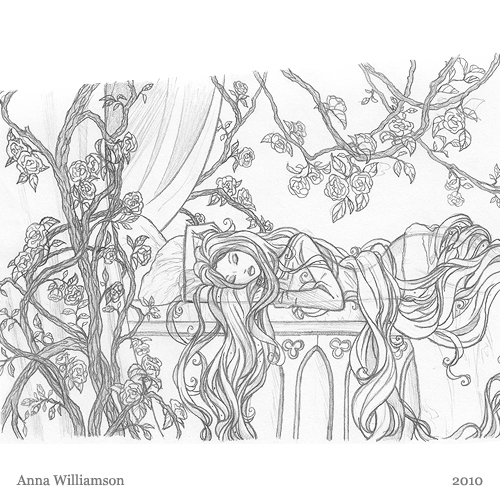 Some of the most beautiful illustrations I’ve seen for Sleeping Beauty have had the roses surrounding her bed, the long hair laying about her, and the wonderful details of a silky or velvet gown, quilt or bed-curtains, and it always helps when the bed has gothic arches and trefoils. And, yes, this one quickly became all about the hair just like the rest of my sketches of the fairy tale princess. I would be so ecstatic if you would so graciously let me color this?